Pacific Garbage Patch Has Grown Four Times, Here's What It Means For YOU! In the Pacific Ocean halfway between Hawaii and California, there’s a giant island of garbage that is growing rapidly. A recent study published in the journal Scientific Reports found that the island is four times the size of California and made up of around 1.8 trillion pieces of trash. Most of the rubbish, around 99.9 percent of it, is plastic. The latest studies show that microplastics make up around 8 percent of the island. And sadly, sea turtles caught in the area were found to have a diet that consisted of 75 percent plastic. Though described as an island or patch of trash, the plastic is still too dispersed to be obvious to the naked eye. 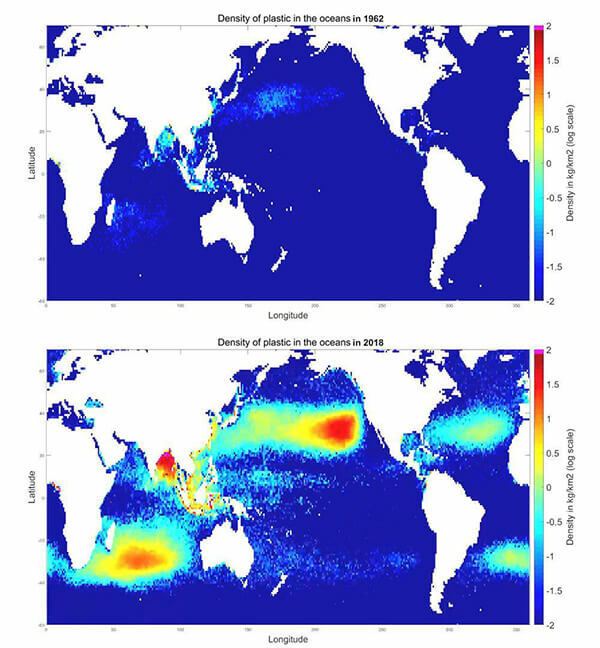 However, mapping of plastic concentrations in the ocean clearly shows extremely concerning concentrations in this area of Pacific — somewhat off the western U.S. coast, as well as another large concentration between Australia and Africa, and another near India. Plastic concentrations in the ocean in 1962 compared to today. Image from Ocean Cleanup Association. The plastics in these patches, as well as microplastics in our waterways, are making their way into the seafood population. In the most concentrated areas, the amount of plastic exceeds the amount of plankton six times — and plankton is the basic diet of most fish, whales, snails, shrimp and clams. Larger fish and seabirds eat the fish that have eaten plankton, and so on down the food chain… so that it is ultimately found in most sea creatures. The way plankton is consumed (usually by filter feeding) means that it is easy for fish to consume the microplastics and small pieces of plastic instead. When fish, turtles and seabirds consume the plastics they often die a painful death, while other fish are also breathing in the chemicals from the plastic, and are then being caught for seafood. The plastic and its chemicals are in turn entering the human diet. The lead, cadmium and mercury found in these plastics is toxic, and diethylhexyl phthalate (DEHP) contained in some plastics, is a toxic carcinogen. BPA, or bisphenol-A, is a chemical used in things like plastic bottles and food packaging. It is also a danger to human health, and is known to have an impact on human hormonal functioning. Studies have found that people who eat seafood are eating 11,000 pieces of microplastic a year. Some 99 percent of that plastic is passed through our bodies, but the rest of it becomes embedded in our body’s tissue. What is the best fish to eat? Fatty fish most easily absorb the chemicals in the plastic they consume, so this means that fish like tuna and swordfish often have the highest levels of mercury, polychlorinated biphenyls (PCBs) and other dioxins. But, it’s impossible to know if the fish you see in the supermarket is contaminated or not. As another example, 300 grams of mussel meat contains an average of 300 pieces of plastic, researchers have found. The good news is that health professionals believe the benefits from eating fish still outweigh the risks. Fish is a great source of protein, minerals and omega-3 fatty acids. It’s great for improving how children sleep and even their intelligence. Based on health benefits alone, the best fish to consume are wild-caught Alaskan salmon, Pacific sardines, Alaskan halibut and farmed rainbow trout. If you’re wondering how many times a week to consume fish, consider this experts opinion. Chelsea Rochman, a researcher who authored a study on how fish get chemicals from the food they ingest, says she won’t be eating fish more than twice a week, and she’ll be avoiding swordfish altogether. Will this latest news affect your fish consumption? With 80 percent of the marine debris coming from land sources, what measures are you taking to reduce the amount of plastic you throw out? Here are 27 plastic items that you can stop using, with suggestions for what you can use instead. 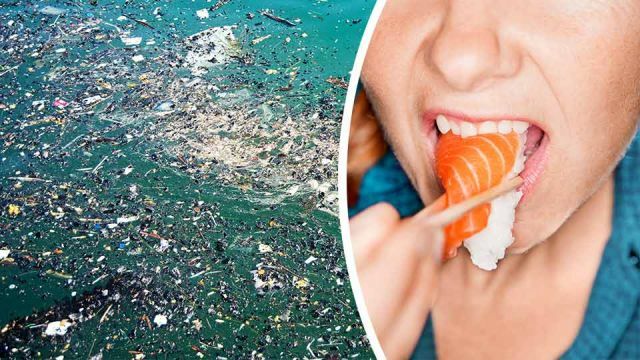 Hey Buddy!, I found this information for you: "Pacific Garbage Patch Has Grown 16X — Here’s What It Means For Seafood Eaters". Here is the website link: https://www.thealternativedaily.com/the-great-pacific-garbage-patch-has-grown-16-times/. Thank you.